Pre-Used Donaldson Torit Clean Air Systems - Why Buy New? Donaldson Torit DCE offers innovative filtration solutions for dust collection, fume and oil mist removal. Fumes can be extracted by Donaldson Torit equipment to give clean air to the workforce. 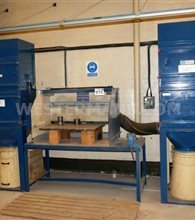 See all Fume Extraction equipment for sale here, ideal for the mechanised profile cutting tables we supply. Donaldson Torit DCE offers innovative filtration solutions for dust collection, fume and oil mist removal. The products are engineered to improve efficiency, save energy and extend filter life time. Over the last 35 years the R & D engineers have brought many new dust collection technologies to Torit DCE customers and their customer-specific applications. Uncollected coolant and machining oil mist can cause slippery floors and collect on machines and walls, creating an unsafe and high-maintenance working environment. Donaldson Torit® DCE® oil mist collection systems remove submicronic contaminants from the plant atmosphere and help maintain a safe and efficient production environment. 100 years Donaldson - The company that dust built. Frank Donaldson, Sr., is fired from The Bull Tractor Co. and proceeds to invent the world’s first effective air filter for a farm tractor in a dusty, Utah field—Donaldson Company is born. Frank fashioned a filter from a wire cage wrapped in eiderdown cloth, mounted the cage on an eight-foot pipe, and attached it to the Bull Tractor’s engine. It trapped most of the dirt before it could enter the engine and destroy the piston rings. Without the air cleaner, the tractor ground to a halt within two days of operation. With Frank’s new air cleaner in place, the Bull tractor tilled the fields day in and day out. Frank reported his findings to Bull headquarters: “The trouble,” he said, “is in the air the tractor breathes.” Dirt laden air was getting into the tractor’s carburetor. “We have to clean the air,” the young man said, “filter it some way.” The response to the letter was a telegram telling Frank to report to Bull Tractor’s front office in St. Paul. When Frank met with his boss, instead of being congratulated for his new invention, he was fired. Bull Tractor felt that Frank was being disloyal for not believing in their product. His firing was a severe blow to Frank’s pride. Yet, he remained convinced that he could build an air cleaner that would greatly improve tractor performance and provide a better product for farmers. Frank’s father (W.H.L.) had a sheet metal shop, which provided the facilities needed for Frank to continue his experimentation. The salesman turned inventor, along with his brother (Bob) and father, took his idea and created an air cleaner. It was a crude, handmade, funnel-shaped device that would clean the air while filtering dust. Armed with handmade samples, Frank hit the road and started calling on farm tractor companies as potential Customers. Ironically, one of his first sales was made to The Bull Tractor Co! In 1915, the first Donaldson air cleaner was introduced to the market. The tractor engine industry was very excited about this new invention and sales grew quickly at Donaldson Company. Taken from Donaldson's web site history. Do you have a Donaldson Torit Dust or Mist extractor to sell? We want to buy more Donaldson equipment. Complete our Wanted Form with details of any used Donaldson Torit machinery you have surplus and for sale.